Complete tool bundle along with modular plugs to make RJ45 or RJ11 patch cords for phone and computer. It includes crimper, stripper and 10 pcs RJ45, 10 pcs RJ11 connectors to make your work smart and easy. A wire stripper combines stripping and cutting functions. Stripping flat wire for : stranded phone wire 2P, 4P, 6P, 8P, 10P, etc. ; intercom/ alarm wire/ 2-cord speaker wire from 18-22 AWG and SPT-1 electric wire. Stripping round cable for: round cable tough plastic insulations, 12-14-16 AWG cable SPT-2 electric wire; assorted solid modular wire UTP STP data communication wires and network cables; multi-conductor cable insulation 1/8"-3/8"; automotive heavy-duty wire up to 8 AWG. 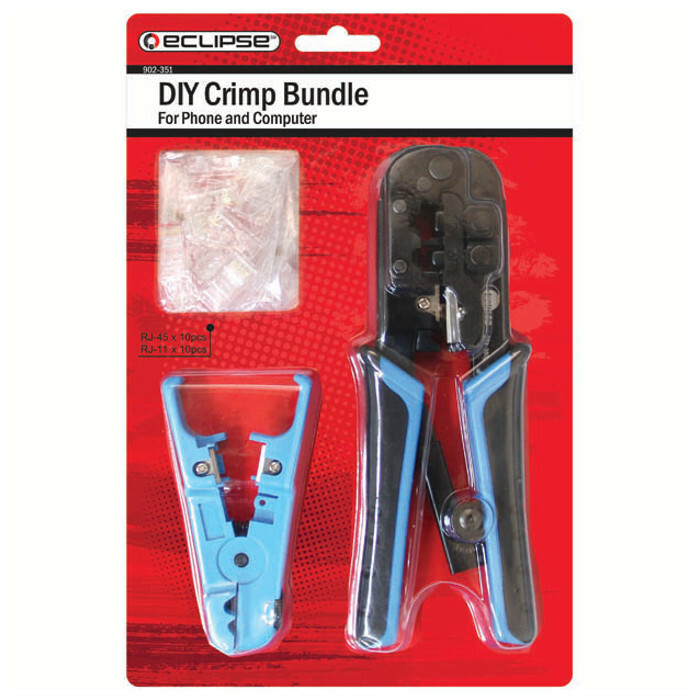 A modular crimper for 4/ 6/ 8P modular connector and stripping twisted pair and flat wire.